First wash, peel and grate 1 onion. In a big bowl, combine meat, grated onion, bread crumbs, salt, egg and black pepper. Mix for 3 to 5 minutes until the mixture is sticky. Heat oil in a frying pan, pick a handful of the mixture and shape it into the shape of a ping pong ball and place it in the pan. Brown these meatballs for a few minutes and then leave a side. Wash, peel and chop the other onion and garlic, then fry them in the same pan. Add turmeric, tomato, meatballs, curry powder, chili powder, cover and cook on medium heat for 20 minutes. In the meantime cook your pasta (how to cook pasta). 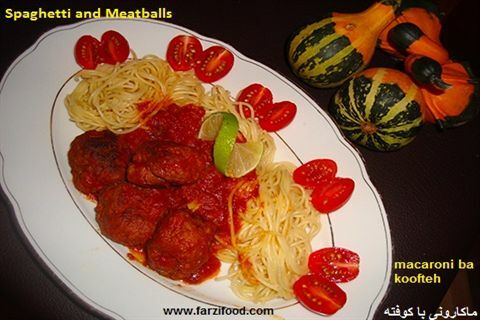 Immediately serve pasta in a serving dish with meatball sauce on top. Prepare the pasta just before serving.